For 20 years, Berrysweet Stuff has been the home of the "famous" Pink Carnation perfume oil. Pure Rose, Fresh Violet, Purple Hyacinth, Lilac, Cherry Almond, Tangerine Jasmine, Patchouli Musk, Honeysuckle, Lily of the Valley, Grape Soda, Pina Colada and dozens of luscious original one-of-a-kind scents are all here as well. All Berrysweet Stuff products are very "animal friendly" (all creations are vegetarian and vegan) and meticulously handmade with great care and enthusiasm. 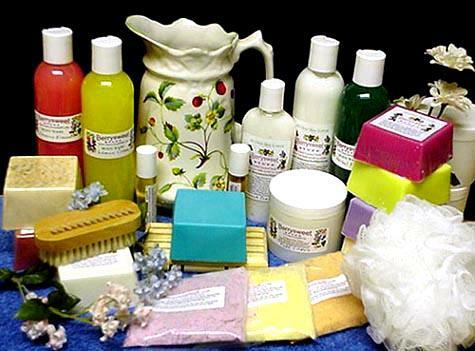 Luxurious handmade soaps, perfume oils, lotions, body butters, lip butters, body washes, liquid hand soaps, bath fizzy powders, face and hair care products are all waiting for you to enjoy. Please take your time and browse around. You will be so glad that you did. Thank you for stopping by!